Corn Marigold (Chrysanthemum segetum): growing, planting, caring. Glebionis segetum (also named Chrysanthemum segetum) is a species of the genus Glebionis, probably native only to the eastern Mediterranean region but now widely naturalized outside of its native range. It can be an invasive weed in some areas. 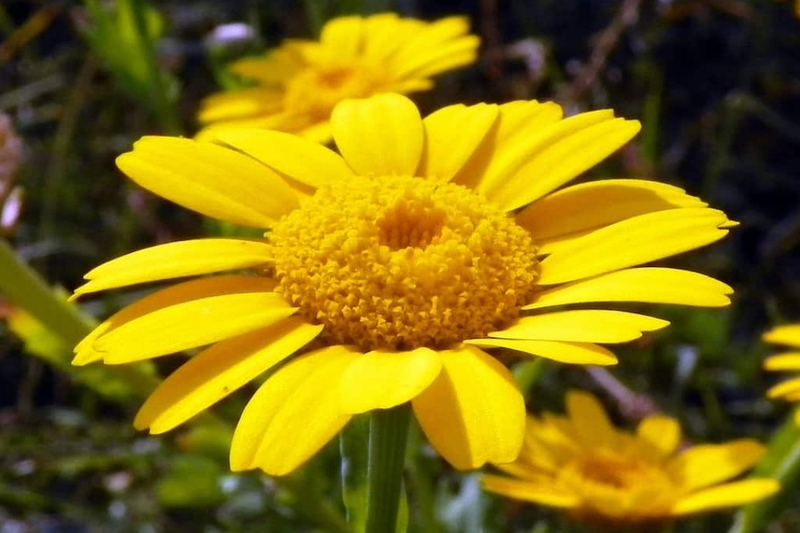 It is is a herbaceous perennial plant growing to 80 cm tall, with spirally arranged, deeply lobed leaves 5–20 cm long and bright daisy-like yellow flowers. Harvest chrysanthemums are wild perennials with compound yellow flowers. Thick stems bear oblong leaves. The plant measures on average 60 cm high. With these wild chrysanthemums, the easiest way is to sow up between March and May. - In pots or in the ground, plan that each foot will need 25 cm spacing, so sow a furrow that you will thin out later. Close the furrow to cover the seeds with one centimeter of soil. - For pot cultivation, sow in a mixture of compost or fibrous compost and sand. Make sure your container is punctured and fitted with a cup, otherwise you risk flooding or premature drying. - For soil cultivation, find a sunny site in rich and draining soil. You've already sown once, so you know how to multiply your chrysanthemums: get ripe seeds in September, keep them dry and out of the way until the next spring, then sow! Mulch if possible the chrysanthemums, even in pots! This will prevent you from watering and weeding in summer and it will protect the roots from cold in winter. Dead leaves and grass clippings will do the trick!